The IntelliPoint Line Powered level probe provides a level swtich with relay output and “On-Board” self-diagnostics to ensure reliability and level sensing elements for a wide variety of temperatures, pressures, and materials. The IntelliPoint carries hazardous area approvals to provide a solution to critical point level applications. 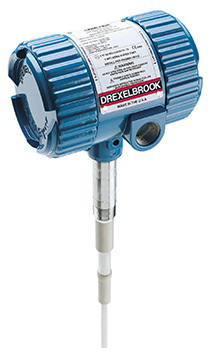 Our BEST and most versatile point level switch for liquids, slurries, granulars, and interface applications. With the IntelliPoint, simply install the sensor in your vessel and connect the line power. The IntelliPoint, with an Auto-Ranging power supply, automatically calibrates itself. The self-test function of the IntelliPoint insures proper system operation. An AutoVerify self check circuit continuously monitors the complete system to verify it is functioning properly. The manual Certify not only checks the function of the system, but also checks the AutoVerify self-test circuits to make sure that they are also working properly. All these features make the IntelliPoint the most versatile RF level switch on the market. DrexelBrook Safety IntelliPoint and Floating Roof Tank Series is now SIL2 certified. Get an introduction to the technology and importance of working safe when measuring level.